Our neighbour has an apple tree that is so old it's a wonder it is still producing apples. The apples are a pale yellow colour, and best used for apple sauce. 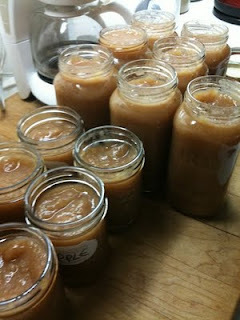 Their texture is dry and full of fibre, which doesn't make for great eating but does make for pretty amazing applesauce. Thankfully, they allow us to take as many apples as we want each year. The catch is, we can only take the ground apples. My 80-something neighbour tells me that the ground apples make the best applesauce, and while initially I didn't believe her I have now realized she is correct. When they ripen to the point of dropping they are at their sweetest, and make a divine sauce. It takes a little bit of pre-work, as I am opposed to insects in my sauce. So I cut open each apple, removing cuts and insects before washing them. Once washed, they go into the pot to boil their way to sweet delicious goodness! The results are worth the time over the steaming hot stove on a warm August day. Come January, I will be thankful I made the effort.